Note: place your mouse over a photo to see its caption. These pages describe the trip that Phil and Beth (plus others) did to the Karakoram mountain range during July and August 2000. This trip was an organised expedition by the Wellington Section of the NZ Alpine Club. We had spent about a year "planning it" (actually sitting around, drinking wine and talking about climbing). There were a dozen people on it, which is the limit we set for the trip, mostly from Wellington. For the record, the following people were on the trip - see the photo. 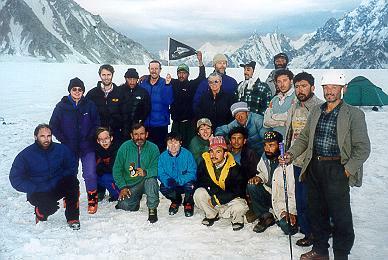 Back row (from left to right): Alan Lowrie (crouching), Beth Burdett, Matt Stevens, Toby Johnston, Alistair Betts, Samueli (staff), Judy Reid (leader), Andrew Johnston, Karim (head guide), Arif (assistant guide) plus more staff. Front row: Dave Duke, Sahib Jhan (staff), Donna Sullivan, Duncan Sherratt, more staff. Plus Chris Bayliss (taking the photo) and me (Phil Castle) - too sick to come out of the tent!! So where is Snow Lake and why did we decide to go there? Snow Lake is in the Karakoram mountain range in Northern Pakistan, arguably the greatest and most spectacular mountain range in the world. Snow Lake is a large snow basin at the head of the Biafo Glacier, and is supposedly one of the largest areas of glaciation outside the poles. Several people we know had been there and it looked like a superb area to visit. Also it offered a wide range of climbing objectivies - from simple snow-plods to extremely difficult peaks. Beth and I weren't so interested in the climbing side of things, instead we were more attracted to the ski mountaineering possibilities. With the Snow Lake area being over 75 square km in size, we had a large amount of terrain to explore. The general plan was to walk up the Biafo Glacier (1 week), base ourselves at Snow Lake (3 weeks), then walk out down the Hispar Glacier via the Hispar Pass (1 week). 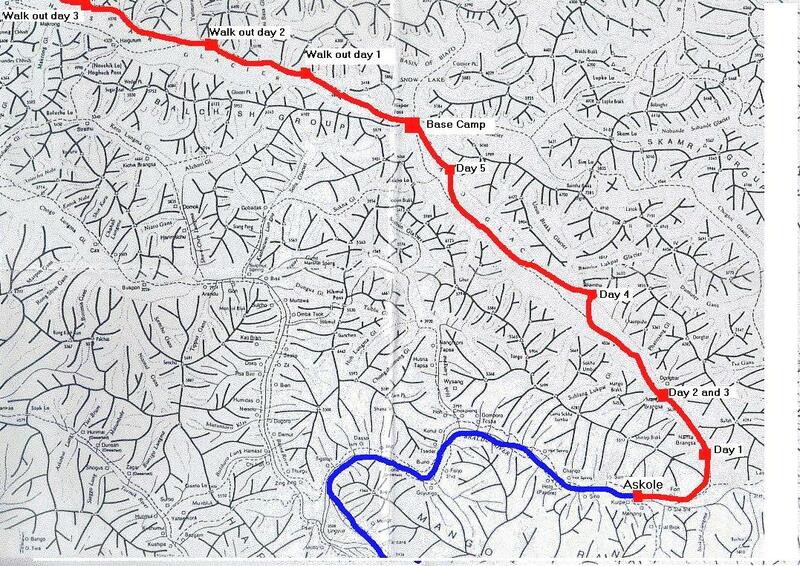 Click here to see a map of the route. We knew before we left that this would be a very hard trip. This is an extremely harsh part of the world. At lower altitudes the temperatures are up into the 40s; the countryside completely dry and barren. 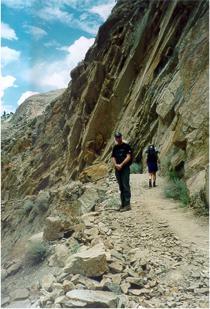 The mountainous areas are heavily glaciated and are very, very rugged. Mellow is never a word which is applied to the Karakoram. 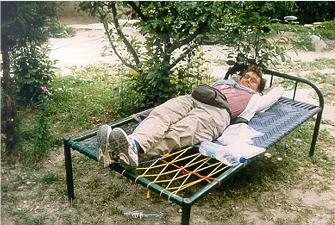 In addition we would be at altitude, and I knew from past experience that I take several weeks to acclimatise. Until I do, there is a large amount of suffering. The last two or three times I climbed at altitude I swore I would never do it again, but then some people never learn. 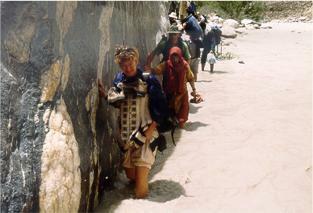 This type of trip is very difficult to organise without use of a tourist / trekking agency in Pakistan. They handled the logistics of getting us and all our equipment and food to Snow Lake. This is not a trivial thing to organise, and we certainly didn't have the time or inclination to do ourselves. Even our guide, who had done this about 30 times before, was driven close to despair on a number of occasions. As you will see, even getting to the road-end was a major job. We chose Hunza Guides Pakistan (HGP) who, for a very competive price, looked after us from the moment we arrived in Pakistan to the moment we left. Everything included - hotels, transport, food, porters, guides. They did a comprehensive job of looking after us; for most of us this was the first time we had been "mothered" to this extent. It seemed luxurious, to start with. So....... we flew out on June 30th, delighted that it was finally happening after so much organising. A morning in Singapore, which we spent with our friend Sim (who's living in Singapore), then off to Pakistan after our last alcohol for 6 weeks. Islamabad was as hot as we had heard (40+ degrees). I find these temperatures completely sapping. Intelligently we had arrived on Friday night, so we had to spend our first two days doing nothing while we waited for Monday so we could attend to some bureaucratic matters. Finally on Tueday we headed off. At 4:30am to beat the heat and get the15 hour bus journey done before dark. This early start was a considerable shock to our systems, but by the end of the trip we were getting used to them, in fact we were suggesting we start even earlier. 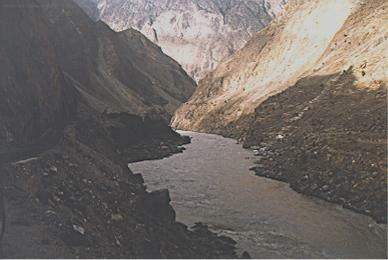 Our bus journey led us into the awesome gorge of the Indus river. This is huge country - the river is a surging torrent and the valley sides go up steeply many thousands of feet. Like NZ but everything is 5 times bigger. And the road is 5 times narrower ... it was a bit of harrowing journey as we wound for hours up the gorge with death-drops off the side of the road the whole way. You don't want to have much of an imagination. It's interesting to note, however, that by the time we came back down this road 6 weeks later, it seemed completely tame. The next few days had far worse horrors in store. We rolled into a small town called Chilas just on dusk completely exhausted by the long bumpy journey and the heat. Another early start saw us driving though even rougher country, until midday when the gorge suddenly opened into a wide plain, and the death-torrent of the Indus turned into a gentle, meandering, harmless river. 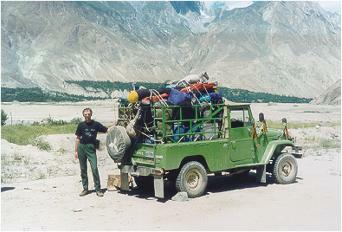 This was Skardu, the main entry point to the eastern Karakorams. Skardu is a delightful little town; at 7000 ft it is a lot more temperate than the low-lying plains (well at least according to the travel book). We spent the afternoon wandering around the market buying last-minute supplies and trying not to faint in the heat. The next morning we left the bus behind and continued in jeeps; the road now starts to get seriously rough as we drove towards the "road-end" Askole. Actually there were several road-ends. The upper part of this valley is unbelievably rough and the road i s often washed-out in several places. By washed-out I mean a hundred yards of the road plus hillside has completely disappeared. The locals try to organise it so there are jeeps in every section of the road; you progress up valley by driving to the first wash-out, ferring loads to the next segment of road then driving to the next wash-out etc. Our first wash-out was bypassed by wading around a small bluff in the river. The water was so cold my legs went numb within about 2 seconds. When this section of road was washed out they got 160 of the locals together to carry three jeeps around this bluff - an impresive effort. By the time we got onto the last section of road was starting to get dark. We couldn't believe the terrain the road had been put through - it would be rough terrain for walking, but as for having a road? It went around narrow ledges blasted in cliffs, zig-zagged down steep morraine walls, crossed active slips and forded fast-flowing streams. However the drivers did know what they were doing, and shortly after dark we finally arrived at Askole. Phew! After three gruelling days travel it was a huge relief to finally be there and I was really looking forward to being on foot.